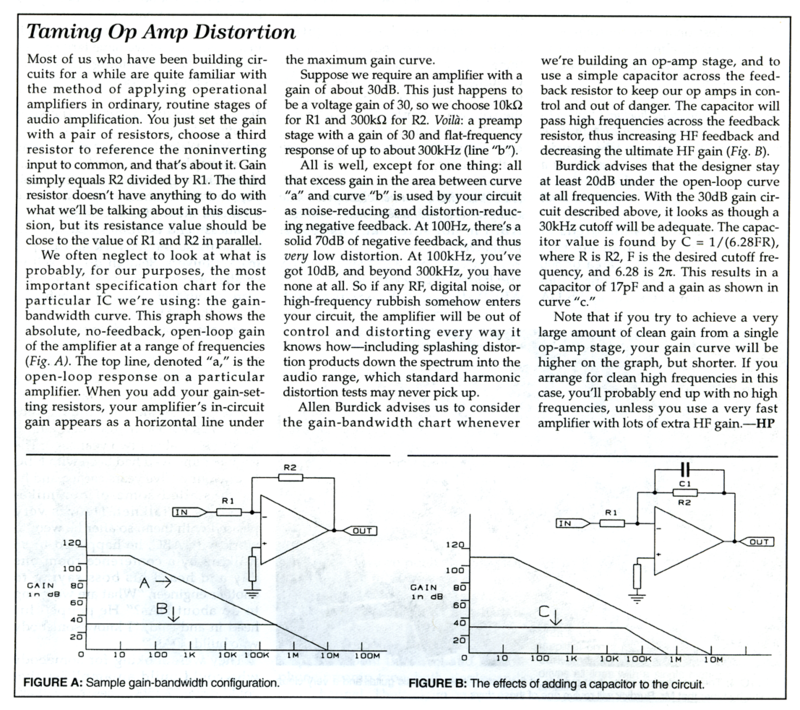 The information on this page is from the article “A Visit to Benchmark Media Systems” by Hilary Paprocki, published in The Audio Amateur, issue 4, 1995. We know that FET-input op amps have less sensitivity to RF interference and are therefore less prone to create IMD. We also know that since all op amps are compromised with regard to their designed-in phase margin, RF-induced IMD occurs with circuits having little or no feedback compensation. I suspect, therefore, that once we have in hand an op amp with sufficient slew rate, bandwidth, linearity, and noise performance, the subtle difference that are audible–and the difference reviewers hear when substituting op amps–may be the result of inadequate feedback compensation around the amplifier stage, or other RF-induced IMD. This means that audiophiles must know how to add feedback compensation to otherwise good amplified systems to prevent gain intersection with the open-loop curve of the op amp. It also necessitates some understanding of shielding practices. RFI also requires audiophiles to have a good understanding of grounding principles, since RF really does not respect the grounding found in many, if not most, systems. RF power can easily be coupled to the signals looping between pieces of equipment unless grounding is properly executed. Ultimately, even though it is more expensive, I believe there needs to be a move to the balanced interconnect system, especially on inputs, as exists in the professional environment.